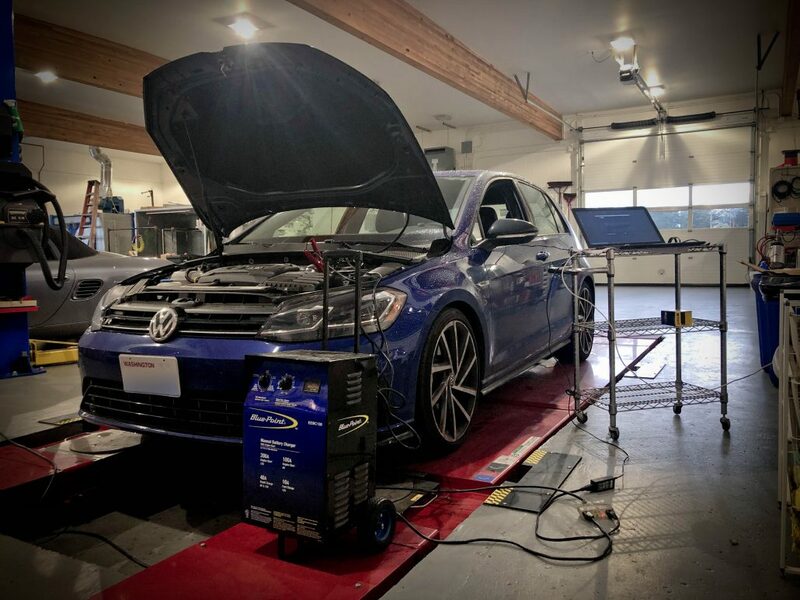 Today we installed a stage 1+ performance tune on our customer’s 2018 Volkswagen Golf R. The procedure is simple and takes about an hour of time for us to complete each tune. The new performance tune will give him an additional 83hp / 70 Ft Lbs of torque, with no other modifications needed. This tune will also optimize the 1/4 throttle range, so while driving in traffic or with the cruise control on, he will see better fuel economy. Just as long as he keeps his foot off the throttle. Tuning the 2018 Gold RThe customer also has an Automatic Shifting Manual Transmission (ASMT or DSG) in his Golf R. With the engine performance tune, it requires an additional tune for the transmission control module. Not only does it need this for the additional horse power, but it also optimized the shifts timing and removes the gear kick down. Kick down happens when breaking or slowing while turning. This is a common complaint from owners with a DSG transmission. In just under a two hours, our customer now has 375hp with 350tq and will be getting fuel economy. Additionally, he purchase a Uniconnect+ cable which will allow him to upgrade to a stage 2 at home, scan his car for fault codes and clear them if needed. For more information, you can go to the Unitronice’s website to see what we can do for your vehilce. To make an appointment for a performance tune, call 425-254-0627 or email us. Meister Werks European & Import is located one block south from The Renton Landing in Renton, WA.